The Genome Analysis Toolkit (GATK) is a full-featured library for dealing with next-generation sequencing data. The open-source Java code base, written by the Genome Sequencing and Analysis Group at the Broad Institute, exposes a Map/Reduce framework allowing developers to code custom tools taking advantage of support for: BAM Alignment files through Picard, BED and other interval file formats through Tribble, and variant data in VCF format. Write a GATK walker that plots variant quality scores using the Map/Reduce API. Create a custom annotation that adds a mean neighboring base quality metric using the GATK VariantAnnotator. Use the VariantContext API to parse and access variant information in a VCF file. The Clojure variation library is freely available and is part of a larger project to provide variant assessment capabilities for the Archon Genomics XPRIZE competition. GATK’s well documented Map/Reduce API eases the development of custom programs for processing BAM and VCF files. The presentation from Eli Lilly is a great introduction to developing your own custom GATK Walkers in Java. Here we’ll follow a similar approach to code these in Clojure. GATK’s Variant Annotator is a useful way to add metrics information to a file of variants. 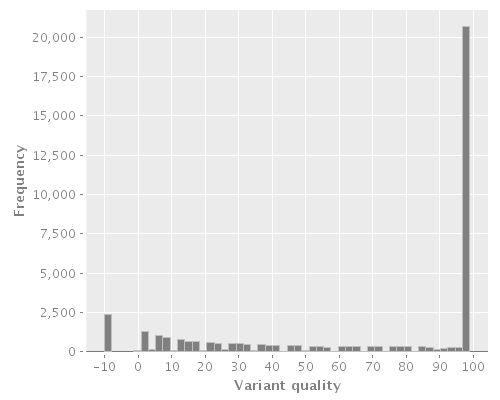 These metrics allow filtering and prioritization of variants, either by variant quality score recalibration or hard filtering. We can add new annotation metrics by inheriting from GATK Java interfaces. Here we’ll implement Mean Neighboring Base Quality (NBQ), a metric from the Atlas2 variation suite that assesses the quality scores in a region surrounding a variation. Retrieve the pileup at the current position. Get the neighbor qualities from a read at a position. Combine the qualities for all reads in a pileup. Open a VCF source providing access to the underlying file inside a with-open statement to ensure closing of the resource. Parse the VCF source, returning an iterator of VariantContext maps for each variant in the file. Extract values from the map: the chromosome, start, reference allele and called alleles for the first genotype. I hope this tour provides some insight into the powerful tools that can be rapidly built by leveraging the GATK from Clojure. The full library contains a range of additional functionality including normalization of complex MNPs and support for phased haplotype comparisons.